Hares and rabbits are members of the Leporidae family. Their distinctive features include: elongated ears that measure from 3.7 to 4.3 inches from the notch to tip, brown coats and lives of 4 to 8 years and can live as long as 12 years. Where rabbits are social creatures, hares typically are solitary and shy in nature until the mating season comes in the spring. They chase one another around in fields during the day and sometimes hit each other. They also feed in groups. 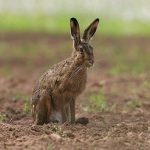 Diet: Hares are herbivorous and prefer to eat grass, herbs and other plant life but also supplement their diets with fruits, vegetables, seeds, buds, nuts, fungi and tree bark and field crops in the winter. Habitat: They are very adaptable and thrive in mixed farmland. They primarily live in open fields with scattered brush for shelter. They are known to be found in fields with fallow land, wheat and sugar beet crops. They are larger in number where predators are few and the pastures are plentiful such as high numbers of crops and woodland. Hares are fewer in number where there are foxes and bird of prey. Impact: As herbivores agricultural land and their nutritious and plentiful crops will attract them. Therefore they can affect farms and agricultural fields, forests, orchards, sports fields in a big way.